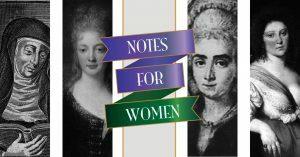 Marking the centenary of women being granted the vote in Britain, the Bristol Ensemble is staging Notes For Women, a year-long celebration of music by women composers. This concert, staged in collaboration with St George’s Bristol, illustrates the history of women composers before 1800 with a selection of works from the medieval to Baroque periods. The women of the Choir of Royal Holloway perform music by the medieval German Benedictine abbess, composer and mystic Hildegard von Bingen. The professional orchestra is joined by the soprano Mariana Flores to perform exquisite songs by Barbara Strozzi, the most prolific composer – man or woman – of printed secular vocal music in Venice in the middle of the 17th century. Natalia Lomeiko performs the Third Violin Concerto by the Venetian-born composer and violinist Maddalena Laura Sirmen, a pupil of Tartini who became a celebrity soloist of the day.